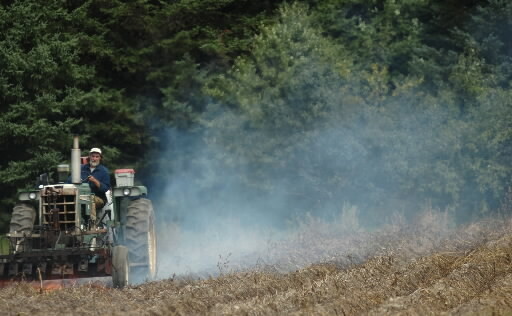 Jim Gerritsen of Wood Prairie Farm in Bridgewater burns the tops of potato vines at the farm in this 2007 file photo. The Aroostook County organic potato farmer who landed in the national spotlight for his advocacy against one of the world’s biggest agriculture conglomerates has filed with his wife for personal bankruptcy protection. Megan and Jim Gerritsen filed for Chapter 7 bankruptcy protection in March, almost two years after selling their Wood Prairie Family Farm in Bridgewater to their son. They listed more than $460,000 in debt. Almost half of that amount is due to the U.S. Department of Agriculture, against which Jim Gerritsen helped lead an unsuccessful court battle over the integrity of the department’s organic certification program. Credit card companies make up the bulk of the other debts listed. Jim Gerritsen said crop losses due to wet conditions in 2011 and 2013 precipitated their financial troubles. Maine’s fall potato production was the lowest in 91 years in 2011, according to USDA reports, which noted heavy summer rains caused “serious wash outs” and left farmers spraying crops five days a week to combat late blight. Years since have proven more favorable, Gerritsen said. He and his wife still work on the farm they sold to their son, Caleb, serving as “farm hands.” The farm, which operates as Wood Prairie Family Farm, primarily sells seed potatoes through its website and a retail mail order catalog. Bankruptcy records show the couple sold Caleb Gerritsen the farm, equipment and their 2015 crop for $166,525 in June 2016, in a deal approved by the lender or lenders with security interests in those assets. The bankruptcy filing comes 36 years after Jim Gerritsen began farming organically in Aroostook County, launching a career that put him in multiple leadership roles advocating for small, organic farms. He is president of the Organic Seed Growers and Trade Association and has led or volunteered time with numerous local and regional organizations supporting small farmers and organic agriculture, such as the Maine Organic Farmers and Gardeners Association. That volunteer work has landed him in the national spotlight at times, most prominently in a 2011 legal battle against the agricultural giant Monsanto. As president of the trade association, Gerritsen served as the lead plaintiff in a case challenging Monsanto’s seed patents and seeking assurance that Monsanto could not sue small farmers if traces of its patented biotech genes were found in their crops. A federal appeals court told the plaintiffs that they must rely on a statement posted to Monsanto’s website, stating that it would not sue over “trace amounts” of contamination in a farmer’s fields. The groups sought to appeal the case to the U.S. Supreme Court, but the justices declined, leaving the appeals court ruling in effect. Gerritsen’s advocacy in that year also took him to the epicenter of the Occupy Wall Street movement, in New York’s Zuccotti Park, where he spoke at the Farmers March on Wall Street. Gerritsen said he and his wife’s personal bankruptcy won’t change his appetite for advocacy or volunteer work.